After warning of strained U.S.-China relations, China's government has issued statements denying any state involvement in the cyberattacks on Google and defending its online censorship. The statements, issued Monday Beijing time and carried on the state news agency Xinhua, come nearly two weeks after Google threatened to pull out of the country after finding that e-mail accounts belonging to human rights activists had been compromised and separately deciding it was no longer interested in self-censoring search results. China's state-controlled media has torn into the US position, accusing America of "information imperialism", "hypocrisy" and "double standards" in order to preserve its status as the unchallenged global super-power. 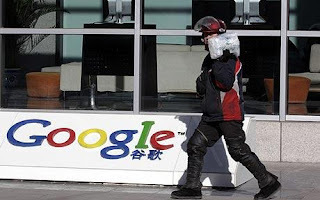 Industry analysts are now waiting for the outcome of Google's talks with the Chinese authorities after Eric Schmidt, the company's CEO, said after releasing company results last week that he expected that Google would change its Chinese search engine in "a short time".